Sunshine always makes me feel better on cold winter days, and it apparently works similar magic for birds. 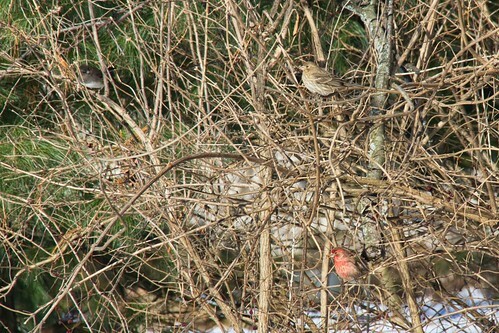 A pair of finches and a Dark-Eyed Junco were flitting among the branches of our backyard shrubs yesterday. 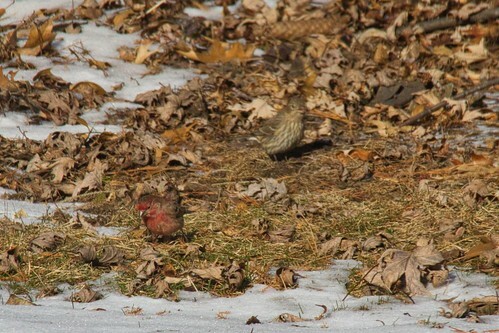 I believe the reddish one and its mate are House Finches, but I can't state that with any degree of confidence. Purple Finches look very similar to House Finches, making them challenging to identify. The sunshine and birds combined to lift my spirits yesterday. It feels as if spring can't be too far away. Oh dear Linda...I am right there with you when it comes to sunshine and it making us feel better! I enjoyed seeing your bird pictures also. Finches are so sweet. Did any of them sing you a song? I've been hearing bird songs off and on for the last week now...outside our bedroom window where we have another feeder. I can't be certain, but I am thinking it could be the finches that feed there, but so do other birds so I can't be really certain. It's nice to know that you have some sunshine. Could you please send some our way? We haven't had a lot of sunshine, George. That's why I enjoyed it so much yesterday. If I could, though, I'd happily send you some. We've got some rain coming, starting Wednesday night, I guess. The last of the snow will disappear, and we'll need a fresh layer to pretty things up again. I love to see the birds, too. They're a bright spot on a cold winter's day. I too noticed more birds around and in the trees than usual. It was sunny most of the day. I would be fairly confident in calling those House Finches. 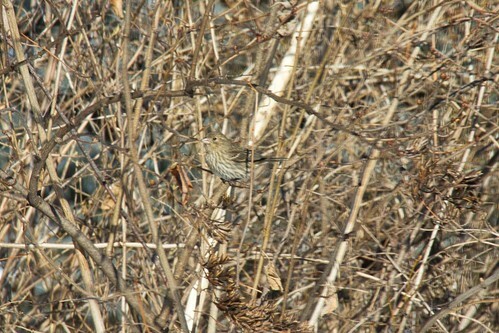 The Purple Finch has more of a purple color,at least the ones I see. 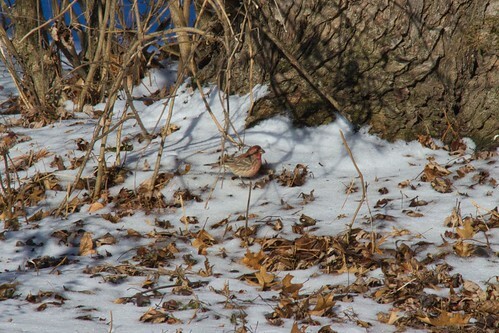 Somewhere I read that the Purple Finch looks like it was dipped in red wine. Nice photos, Linda. I'm afraid spring is still too faraway but yesterday I saw a new collection in Tchibo catalogue titled "prepare for spring" and I thought, that's nice to think in colours! :) I agree with you, son and birds do lift the spirits! Hi, Troutbirder. Yep, we are agreed on sunshine and birds. 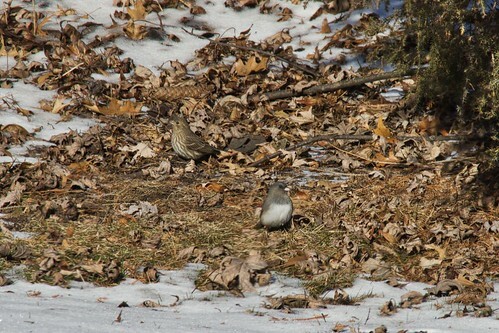 You had quite a bevy of mourning doves at your feeders! It's so nice to see the sun shine and snow melt :) Wonderful images Linda! Thank you, Mersad. It's a gloomy, dreary day here today; and the snow is all but gone now. Two of my favorite topics....sunshine and birds!! We have finally gotten some of that beautiful sun!!! The birds are beginning to get more active down here in the Gulf Shores area!! I love to hear them singing!! I haven't heard the singing yet, but I'm looking forward to it! I'll have to show these pictures to my three-year-old niece. She loves birds. Sometimes we watch videos on Youtube of birds hatching, or birds searching for food. She's fascinated by it! Thanks so much for visiting, Angela. I hope your niece enjoys the post. I'm right there with her when it comes to enjoying birds and their activities. I'm addicted to watching the Decorah eagles nest cam. We're waiting on Egg #3 tonight. To Behold the Beauty by Linda is licensed under a Creative Commons Attribution-NonCommercial-NoDerivs 3.0 Unported License.